Figure 6 Extract from an Aspergillus niger isolate analysed by HPLC-DAD-FLD. Ochratoxin A, B, a, and b, are easily seen in the lower fluorescence trace (ex. 230 nm, em. 450 nm) with the fluorescence spectra of ochratoxin A and a inserted. 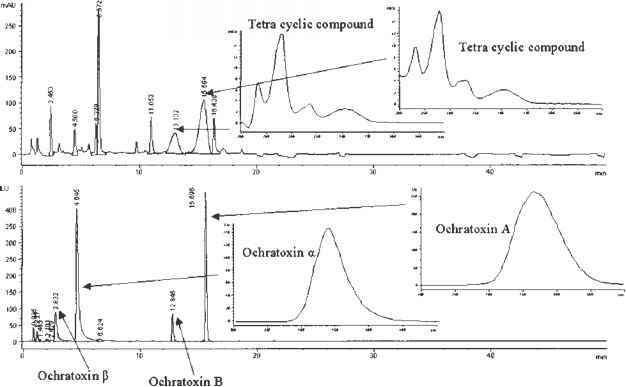 In the upper UV trace (210 nm), several tetracyclic compounds (UV spectra inserted) obscure the detection of Ochratoxin A, B, and a.
lipids, and sterols. The advantage of GC is its very high separation power in comparison to HPLC and its relative ease of operation. Furthermore, GC is easily interfaced to MS (GC-MS) or other spectral detectors, forming a powerful tool that can both deliver high separation power and give structural information in one run. The most important step in GC is the injection, which if performed poorly can have a severe effect on the separation power. The most commonly used techniques for liquids are split, splitless, on-column injection, thermal adsorption of trapped volatiles, and headspace (Grob 1993). Currently fused silica columns for gas-liquid chromatography are used due to the high resolution power which is needed to separate complex mixtures of volatiles such as mono- and sesquiterpenes. Different stationary phases as well as film thickness can be chosen depending on the polarity and volatility of the compounds to be separated. More volatile compounds require a thicker film column, whereas high separation power is best obtained by thin film columns (Grob 1993). The mass spectrometer can be used to: (a) provide structural information from fragmentation in electron impact ionisation (EI) easily searched in databases, (b) accurate mass using the modern time-of-flight (TOF) instrument, or (c) using ion-traps (or multistage MS -MS instruments) as very high selectivity detectors (or to get very detailed fragmentation information). Both TOF and MS -MS instrumentation greatly increases the capability of the instruments, and the metabolite profiles that can be obtained from these instruments are generally not needed for fungal identification and they are therefore not discussed further. For metabolite profiling, the most important detection method is MS which in many cases will give a molecular ion (and thereby molecular mass) and a characteristic fragmentation pattern—the mass spectrum—from each compound eluting from the column. The limitations of MS in the identification of unknowns can be an insufficient information content of the mass spectrum to stereo and positional isomers in aromatic systems (Ramaswami et al. 1986). A great potential for MS is the ability to scan for a selected number of characteristic ions—selected ion recording (SIR or SIM) which can improve detection sensitivity from the ng level to the pg levels. Flame ionization detection (FID) is an important and robust GC detector, which basically detects carbon atoms in the sample with high sensitivity and over a large dynamic range, but with no structural information. If metabolite profiles are compared on two different columns of substantially different polarity, similarity in the retention times of metabolites on these two columns can be used for their indirect identification (Davies 1990). Fourier transform infrared spectrometry (FTIR), can be used to detect compounds eluting from GC columns. Most functional groups, in particular the carbonyl group (C=O), have a unique absorption (fingerprint) from vibration energy. The FTIR will therefore give an unambiguous identification of functionality of the functional groups of compounds and it is possible to identify these by comparing spectra to those of known authentic compounds. The method is nondestructive and can therefore be used in combination with either FID or MS. GC-FTIR will often allow discrimination between structural- and stereo-isomers making the method a very powerful supplement to GC-MS. The major drawback of GC-FTIR is a lower sensitivity compared to GC-FID and GC-MS. Volatile metabolites are believed to play an important role in chemical interactions between fungi and other organisms. Recently the total volatile profile of the endophytic fungus Muscodor albus was demonstrated to effectively inhibit or kill a number of other fungi and bacteria (Strobel et al. 2001). In general volatile production is correlated with spore formation fitting well with a chemical ecological point of view. The insects, often adapted to the toxic metabolites produced by the fungi, can act as vectors for fungal spores for their further spread. 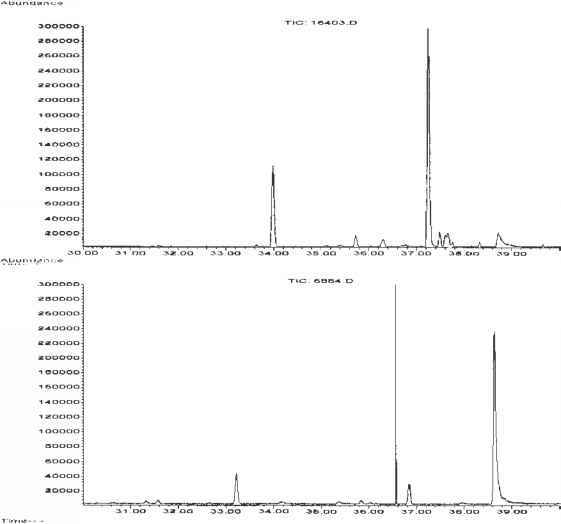 Figure 7 Chromatograms showing profiles of volatile sesquiterpenes produced by Pénicillium roqueforti (IBT 16403) and P. carneum (IBT 6884). The two compounds produced in largest amounts by P. roqueforti are b-elemene and (+ )-aristolochene, whereas the three largest peaks in the P. carneum chromatogram represents geosmin, an unknown sesquiterpene and dodecanoic acid methyl ester. Some important studies have shown that the production of some possibly species-specific sesquiterpenes could be related to the production of important mycotoxins such as aflatoxins (Zeringue et al. 1993) and trichothecenes (Jelen et al. 1995). Often fungal metabolites are only present in particular compartments of the organism such as in the conidia (or sclerotia), and these may have a role in protecting them against being eaten by other organisms. 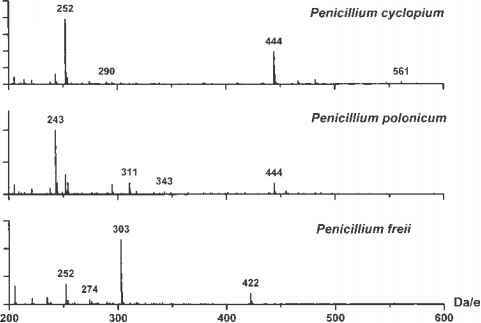 Microfungi such as the penicillia usually produce a species-specific set of volatile metabolites (Larsen 1998; Larsen and Frisvad 1995a). Often even very closely species such as P. roqueforti and P. carneum (Figures 7 and 8) can easily be differentiated by the volatiles they produce. Fungal volatile metabolites include small ketones, alcohols, esters, and hydrocarbons such as small alkenes, mono- and sesquiterpenes. The latter are by far the most relevant metabolites for identification purposes or for use as biomarkers (Larsen and Frisvad 1995b). The major sesquiterpenes produced by P. roqueforti are b-elemene, selenine, and patchuline (Larsen and Frisvad 1995b) together with aristolochene (Figure 8), recently reported by Demyttenaere et al. (2002). In general P. carneum produces relatively lower amounts of sesquiterpenes than P. roqueforti, however, the species has a much more pronounced moldy odor than P. roqueforti due to the production of the moldy smelling compound geosmin together with large amounts of isopentanol (not shown in Figure 8). 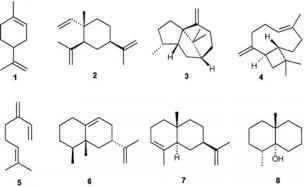 Figure 8 Structures of the main fungal terpene metabolites obtained from the headspaces of Pencillium roqueforti and geosmin produced by P. carneum. 1) Limonene 2) b-elemene 3) g-patchulene 4) b-caryopyllene 5) b-myrcene 6) (+ )-aristolochene 7) a-selinene 8) geosmin. compounds, and a lot of spectral information can also be found in the atlas of Joulian and Konig (1998). A good review of methods for the identification of sesquiterpenes can be found in Konig et al. (1999). As mentioned in Section 3, the sensitivity can be greatly enhanced by the use of SIR, and the method has been used together with SPME to investigate how early volatile metabolites can be detected (Larsen 1997). The SIR of four to seven of the most characteristic ions of mainly sesquiterpenes from cheese-associated fungi allowed the identification to species level within two days, at which time they had not started to sporulate and were only white mycelia. Volatiles from a mixed culture of P. roqueforti and P. commune, inoculated in a ratio of 1000:1, could be used to detect both fungi within three days, showing the possibility of checking starter cultures for cross-contamination.